Posted on 11/18/2014 in Game Recaps. 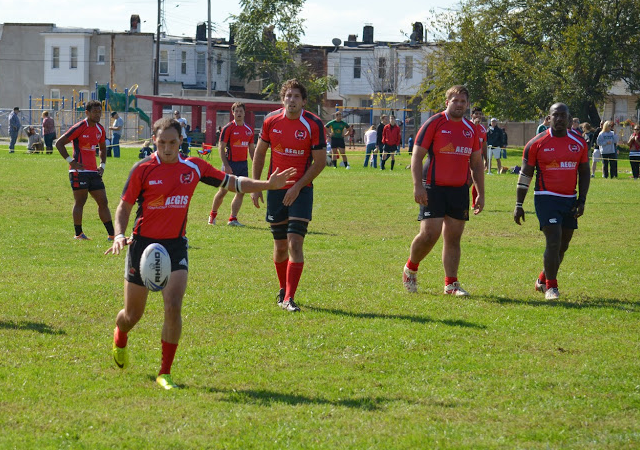 The Potomac Exiles travelled to NOVA on Saturday, hoping to extend their seven-game winning streak. Potomac started out dominating possession, and capitalized with a scamper up the middle from scrum-half Chris Saint. However, the win would not come as easily as the visitors hoped. Potomac turned the ball over in their own half, then compounded their mistake with a defensive lapse off of the ensuing scrum. NOVA’s center broke through the defense, who offloaded to a supporter for the try. The conversion was hit to tie the match, 7-7. At 12 minutes, Saint scored his second try of the day, and fly-half Matt Quigley converted for the 14-7 Exiles’ lead. Winger Joanel Joseph finished off a long phase, and Quigley hit again to put the visitors ahead, 21-7 with eight minutes to go in the half. However, a mis-play off a chip kick on the last play of the half allowed NOVA back into the game, cutting the deficit to 21-14. Potomac continued its flat play, and had a real match on their hands when NOVA tied the game, 21-21. Some sustained possession led to a try from Captain Ben Wiedemer, and two long scores from winger Chris Frazier swung the momentum back in the Exiles’ favor. Forward sub Mark Crick provided the fresh legs the team needed, punching in a try with eight minutes left, sealing the 45-21 win and an undefeated fall for the Potomac Exiles!